We all love our gadgets but they appear not to be so kind back to us - that's the finding of a new report from the IEA on the impact of the energy consumption of our shiny new toys. The International Energy Agency publication called Gadgets and Gigawatts, which was published last week in Paris, says electronic consumer goods could demand up to 1,700 Terawatt hours of electricity by 2030. Unless radical changes are made to the way TVs, computers and other devices work, that huge figure for electronics will equal the current power consumption of Japan and the US combined. Consequently, the IEA says governments need to force hardware makers to build less-hungry gadgets if we're to avoid a power crisis. Needless to say, that projected tripling of current consumption by 2030 has dire consequences for the health of the planet too. On a more positive note, the report points out that current energy-efficient techniques used in mobile devices to extend battery life could be applied across the board to cut that surge by up to half. 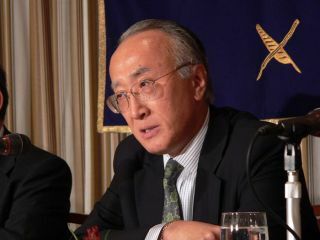 IEA executive director Nobuo Tanaka explained: "Many mobile devices are already far more efficient in their use of power than other devices which run off a mains electricity supply. "Because extending the battery life of a mobile device is a selling point, manufacturers place an emphasis on designing products which require very little power."